The Clown King is a micro history of popular entertainment in the period 1840 - 1860, woven out of the career of Arthur Nelson, the Clown King. Born around 1816, Nelson began as an actor in provincial and minor theatres before specialising as a ‘talking’ or Shakespearean clown. While some contemporaries wrote accounts of their lives, Nelson left no such formal record and yet, as one of the most popular clowns at the time, his career was one full of interest. Traced through playbills, advertisements and newspaper reports of the period, he moved seamlessly between circus ring and pantomime stage, as well as performing in concert halls with his musical novelties. His ‘benefit’ stunt, being drawn in a washing tub by four geese, although not original, drew huge crowds when performed in a town or city. This was to end with disaster in 1845 at Great Yarmouth, when spectators watching from the suspension bridge over the river Bure were propelled into the river causing the largest loss of life there has ever been in the town. 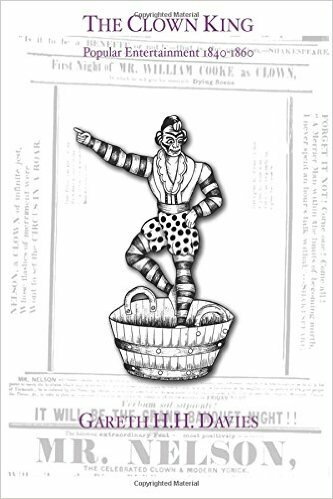 Using Nelson’s career this book explores the social and economic place of the clown in circus, pantomime and the wider milieu of early Victorian society. His engagements enable the reader to trace the changing nature of the circus from rings, in semi-permanent wooden buildings and theatres, to the development of itinerant ‘tenting’. His collaboration with other artistes allows for an exploration of performance as display, whether it be the ‘pseudo-art’ of tableau vivants or ‘race-science’ with the exhibition of dwarfs, microcephalic children and peoples of other cultures. His performance material gives an insight into cross-fertilisation of popular music between Britain and the United States before the American Civil War. This period saw rapid change as an expanding middle-class wanted their leisure-time to include entertainments that reflected both their aspiring cultural values and a desire to understand the technological and scientific progress of their age. ©2000-2016 Joyland Books. All Rights Reserved.